An eclectic collection of music, an array of books and films. It seemed rather depressing to enter into a new year with the death of an old hand, but as Dean Ford left us on the last day of 2018 one cautiously wonders who will be leaving us as we move into 2019? One other noticeable thing for me is just how forgotten a lot of these musicians, that meant something to me, are – Dean Ford is a case in point. Thomas McAleese was born in Scotland as Europe recovered from war and like all post-war families from the period, they were glad to be alive, out of conflict and optimistic in the wake of hardship as Europe rebuilt itself. Consequently, opportunity arrived like never before as the sixties advanced the world socially with Pop culture, permissive values and a more open-minded populace that began to embrace the sexual revolution and the idea that youth had a relevant voice as they demonstrated against war and challenging old values and traditional wisdom – or lack of it. McAleese was one of that new generation. He changed his name to Dean Ford after combining Dean Martin and Tennessee Ernie Ford, becoming popular on the Scottish Pop circuit as a member of The Gaylords, later Dean Ford And The Gaylords. In that period in Britain at least, Pop bands were gaining widespread exposure, often supported by pirate radio stations like Radio Caroline, Radio North Sea International, who in turn were inspired by Luck Lucky Luxembourg broadcasting commercially to the UK from the continent and capturing the attention of youth under their bedclothes with a transistor radio and a torch when the parents presumed they were asleep. Various new musical movements grew with such influence on society that even the BBC had to eventually give in and create a homegrown official outlet for the youth and in 1967 Radio One was born, the first song they played was The Move’s Flowers In the Rain, written and sung by Roy Wood. The Gaylords, with various line-up changes, had become a popular attraction in Scotland and even travelled to Germany, but on return to England in 1966, they found that London was swinging. They changed their name to The Marmalade and were signed by CBS records. From the late sixties to the early seventies they had more than 10 hits, their biggest being a cover of Ob-la-di Ob-la-da that made it to the number one in 1969 (a first for a Scottish band). Some of their own and better songs weren’t as big as hits as they should have been, Jimi Hendrix cited their song I See The Rain (written by Ford and guitarist/pianist Junior Campbell) as one of the top songs of 1967, a hit in Holland it failed to chart in the UK. As it turned out their two sixties recorded albums, There’s A Lot Of It About (1968) and Reflections Of The Marmalade (released in 1970), were a mixture of popular songs of the time, along with their own compositions. For their second album they had moved to Decca but the problem with these optimistic breezy harmony Pop bands was that they were often guided by record company and management – popular success the benchmark for their relevance. Consequently, their albums can be patchy and contain some songs that don’t matter, a mixture of their own hit and miss songwriting and management and record company hit and miss song suggestions. Still, the outside sourced Lovin Things (1968) was a hit, making it to No. 6 and Baby Make It Soon (1969), written by Tony Macaulay made it to No. 9. Other classic songs such as Kaleidoscope from their second album, were never released as singles and are lost to time. There was still time left for the band to write their biggest hit, Ford and Campbell’s Reflections Of My Life (1969). It reached No. 3 in the UK and No. 10 in the US and sold over 2 million copies. The follow-up, Rainbow, also reached No. 3 in the UK. Another Campbell/Ford composition, My Little One, reached No. 15, but America continued to elude them. Then, Junior Campbell left, writing a hit on his own, Hallelujah Freedom reaching the top 10 in 1972, a follow-up, Sweet Illusion, reached No. 15. He was replaced by Hugh Nicholson, Nicholson taking on the songwriter role and the hits continued into the seventies, most famously with Radancer and Cousin Norman both reaching No. 6. Despite the continued Pop hits with Nicholson at the songwriting helm, the band had changed the direction for their 1971 album Songs. Disappointing sales led Nicholson to leave and form Blue. Marmalade (now without the prefix) soldiered on with Our House Is Rocking, but the end was nigh (Scottish accent). As with many sixties pop harmony groups, the cabaret and the nostalgia circuit beckoned where Marmalade are still active to this day. 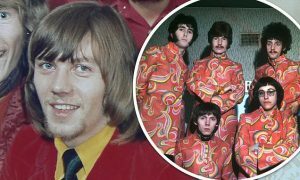 Throughout their career, The Marmalade released so many good songs, great harmonies, catchy Pop, sometimes Psychedelic but in the sixties at least, always with that optimism that opened the curtains to the sunlight whenever you heard them. This was highlighted and fronted by that special warm voice of Dean Ford, a classic sixties legend that will live forever in our house, have him come and sing in yours, too, and spread that optimism around, god knows we need it now.